(Photos by Mike Brooks) – It is one of the hardest core awards in the world of hot rodding and it is one that guys throw millions of dollars at their cars to win. The Ridler Award still stands and likely forever will as the highest achievement in the hot rodding world, perhaps even beyond the more specific America’s Most Beautiful Roadster award because of the fact that virtually any type of car can be entered for consideration. When one considers that a 1959 Cadillac station wagon won this year’s award that’s an inarguably fun point. There was not a weak sister in the bunch when looking at the Great 8 contenders. Each of the machines was creative, beautiful, and finished to an amazing degree. The engine selections were interesting. One traditional small block, one Ford Coyote engine, and two twin turbocharged 632 Chevy big blocks. The other four? All GM LS variants. While this is not a contest of performance in terms of the cars running, they do HAVE to run for a short period as they need to be driven to the judging area, at least that is our understanding. Mike Books blasted these photos and they are awesome. Check out the list of contenders and then the images below them! Here’s the list of Great 8 contenders and below that are the photos! NOS News: Dry Nitrous Plate For Sniper EFI Fabricated Race Series LS Intake Manifolds Crazy Close: Watch Sidnei Frigo and Jose Gonzales Run IDENTICAL Speeds and Elapsed Times On The Same Pass! 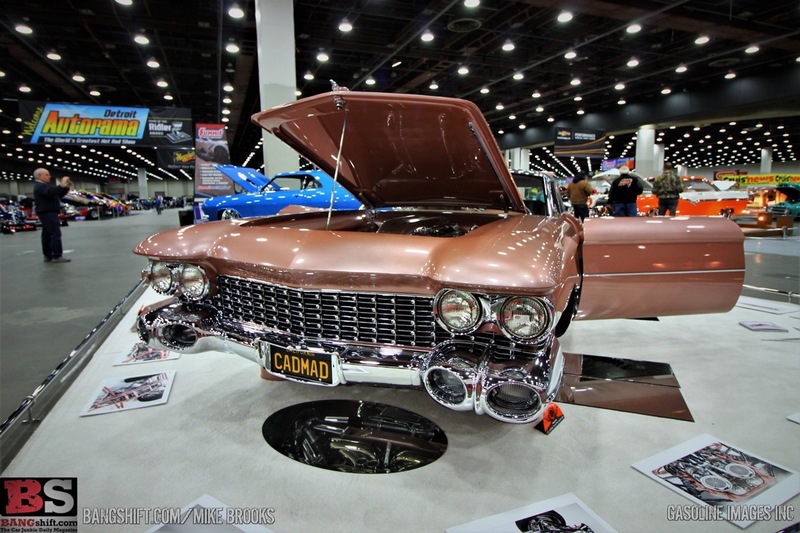 Attended the show again this year and was very impressed with the implementation of design mostly with the 64 Arcadian, 65, Chevelle and of course the 59 Eldorado. Good time as always speaking with the amazing Gene Winfield, seeing Murray Pfaff’s re-do of his Imperial and seeing lots of great ideas to hopefully remember for any future projects. The Chevelle, the \’34 and the \’32 are the only attractive cars in the field. To the owner of the Willys, 1993 called and it wants its paint job back. The Camaro could be literally any Popular Hot Rodding cover car from 2001-2010 and the wheels look like they came out of a Tire Rack ad in the back of Popular Mechanics. The Caddy is creative and a great color choice, but the chopped roof is an abomination and belongs in a Munsters episode. I like the engine treatment in the Sedan Delivery, but with that color combo I can\’t unsee the Gravedigger.